captures and prints snapchat pictures to a connected BERG Little Printer. a tool to capture and print snapchat pictures to a connected inkless BERG Little Printer. 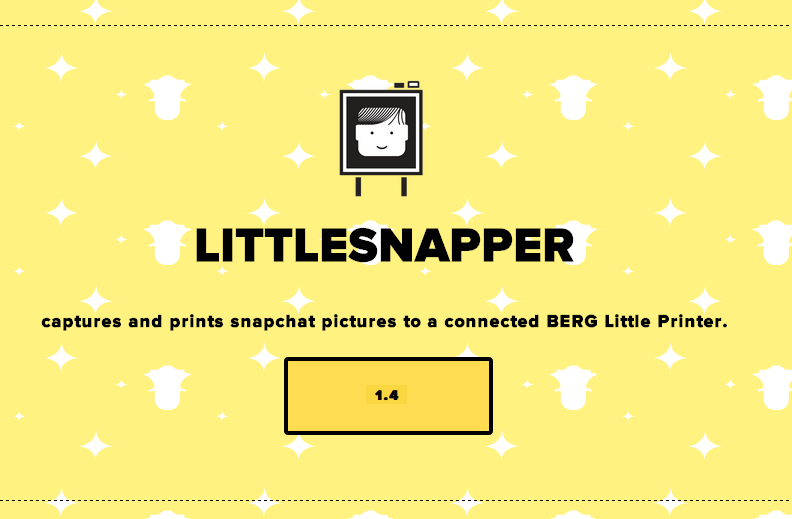 littlesnapper captures unread snapchat images, hosts the image for 45 seconds (or any amount you choose) to allow the little printer to parse and print the image and then deletes it. note: due to the printer being a thermal printer, the images it will print will be black and white. yu wer expekting culurs rite? serious note: littlesnapper won't work anymore because BERG Cloud has shut down. In ALL cases this should be true as you do NOT need to keep images on your server. api_key = your littleprinter API key. server_url = your servers root directory that littlesnapper is hosted on. ngrok is awesome to host local servers securely on the web. if you type null or a strange value, littlesnapper defaults to 45 seconds. also, make sure your folder permissions are setup properly. It is possible to use cron jobs on a server for littlesnapper. and enter the path to where php is (/usr/bin/php) & the directory to where littlesnapper is. just don't turn it into a cron job disaster like mine was. support for printing multiple snaps. include more dithering features for configuration. munchi says thanks, for using this software, knowing that you will do good with it. BERG Cloud for creating Little Printer!